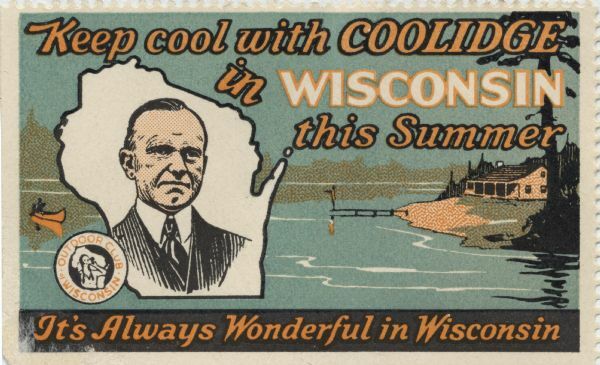 "Keep Cool with Coolidge in Wisconsin This Summer." A stamp presumably issued by the Outdoor Club of Wisconsin, to promote tourism in northern Wisconsin. In 1928 President Calvin Coolidge spent the summer fishing on the Brule River, with a high school in Superior serving as the vacation White House. Five presidents, beginning with Ulysses S. Grant, have fished in Wisconsin.